It is incredibly important that we recycle, not only will it save you money but it is vastly important to the environment and the future. 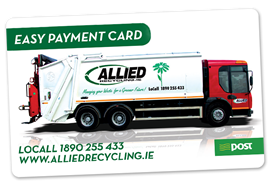 Ireland’s landfills are filling up quicker than we realise, therefore, landfill prices will continue to rise. Although, we can easily prevent this by REDUCING, REUSING & RECYCLING. What Goes In Your Black Bin? Anything that cannot be recycled or composted can be diposed of in your refuse bin. No black bags in the blue bins – Clean dry loose material only.